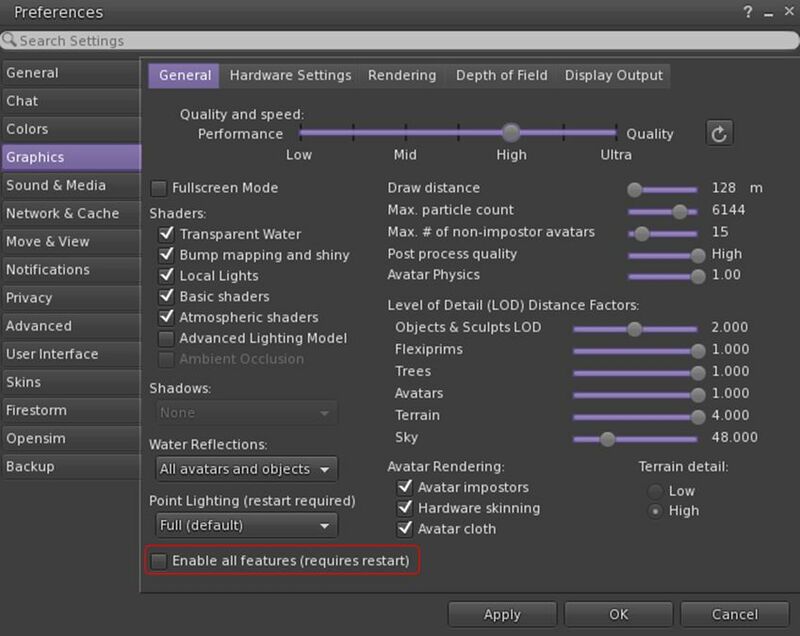 On Saturday, October 3rd, the Oculus Rift supporting CtrlAltStudio viewer updated on Windows to version 1.2.5.43397. The release sees the viewer reach parity with the Oculus SDK 0.6. However, it is not at this point being regarded as a “formal” release, as David Rowe, the viewer’s developer, notes that it requires additional user testing. 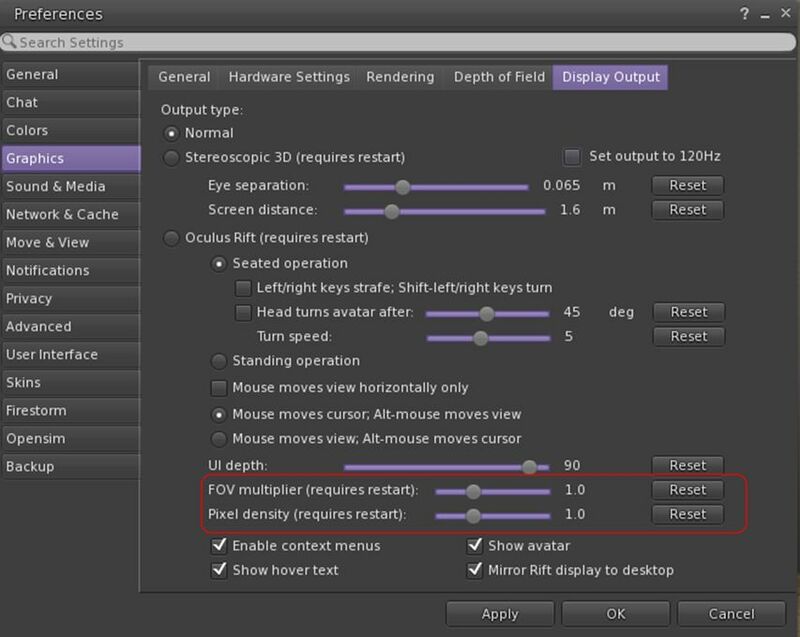 If you switch between direct and extended Rift display modes, you’ll need to restart the Oculus Configuration Utility and the Oculus VR Runtime Service. As always, for a full list of changes and updates, please refer to the release notes. The release doesn’t see the viewer updates to a more recent Firestorm code base than 4.6.9, and there is no corresponding Mac release at this time. On December 4th, Oculus VR released the latest software version for the Oculus Rift, version 0.4.4. A beta release, it includes an number of bug fixes and improvements, while retaining experimental support for Linux. As a result of this update, Strachan Ofarrel (aka Dave Rowe in the physical world) released an updated version of the Alpha version of his CtrlAltStudio viewer on Friday, December 12th. Version 1.2.2.41224 Alpha 5 brings with it not only support for the SDK update but also, courtesy of Mac viewer developer Cinder Roxley, a Mac build as well. As usual with the Alpha version of the viewer, this release is installed into its own directory / folder, and so can be installed alongside the current release version of the CtrlAltStudio Viewer. A clean install is not required if you have been running previous alpha versions. On October 24th, Oculus VR released the latest software version for their SDK. Among the many updates came support for Unity Free developers (Unity versions 4.5.5 and up), and experimental support for Linux. A fix for Rift positioning in third person orbit camera view. 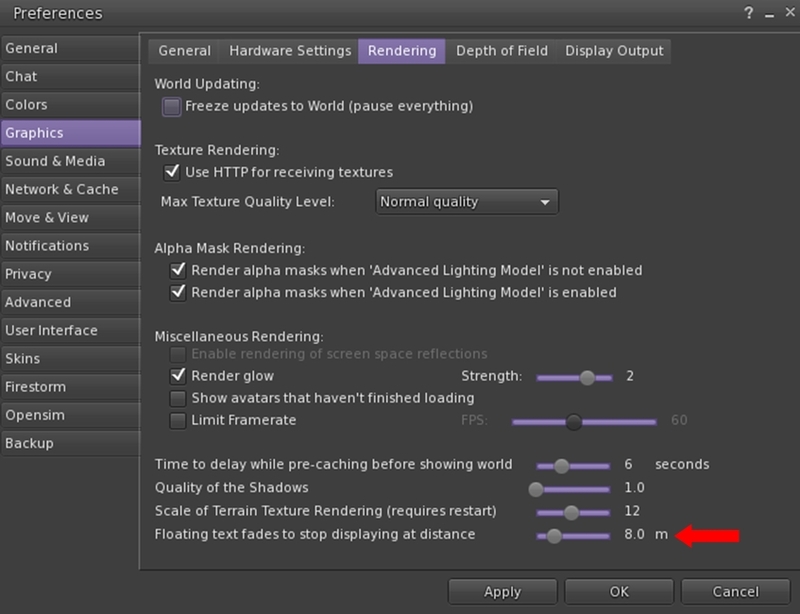 The “Timewarp waits” option shouldn’t really be made visible to the user, but in my testing I found that it seemed to help to be able to turn it off if rendering at significantly less than the frame rate the DK2 is set at. The variability of the frame-to-frame timing in Second Life may well be why. 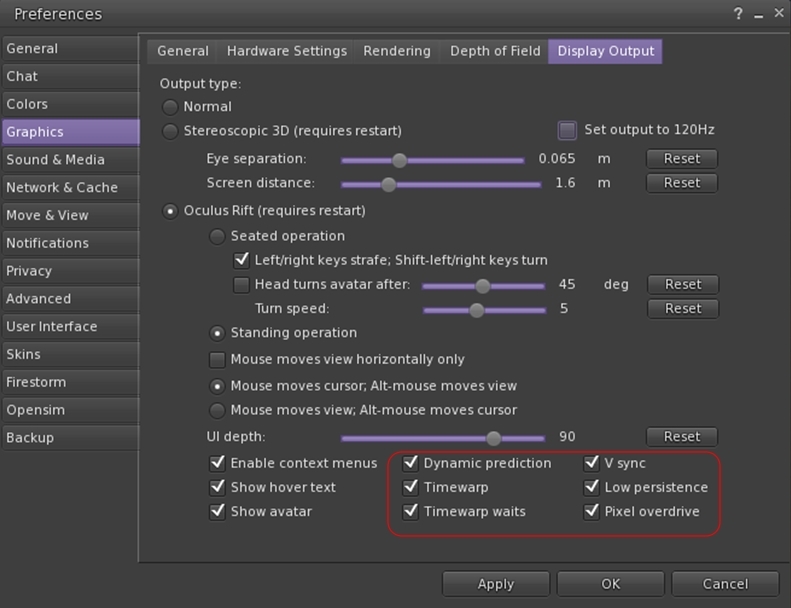 The optimum settings depend on what frame rate you’re achieving and your personal preferences and sensitivities to different display behaviour: if you’re achieving the ideal of 75Hz including while turning your head then the default of all options enabled is best; otherwise you will probably want to try disabling one or more, consider configuring your Rift display to 60Hz, and possibly try enabling triple buffering in your display driver. The Oculus 0.4.3 runtime is required. Strachan Ofarrel, known in the physical world as Dave Rowe, continues to enhance the alpha version of his CtrlAltStudio viewer for the Oculus Rift DK2 headset and windows. Dave has been working steadily on adding DK2 capabilities to CtrlAltStudio for a while now, and this marks the third update to the DK2 Alpha version – officially called 1.2.2.41206 Alpha 3. 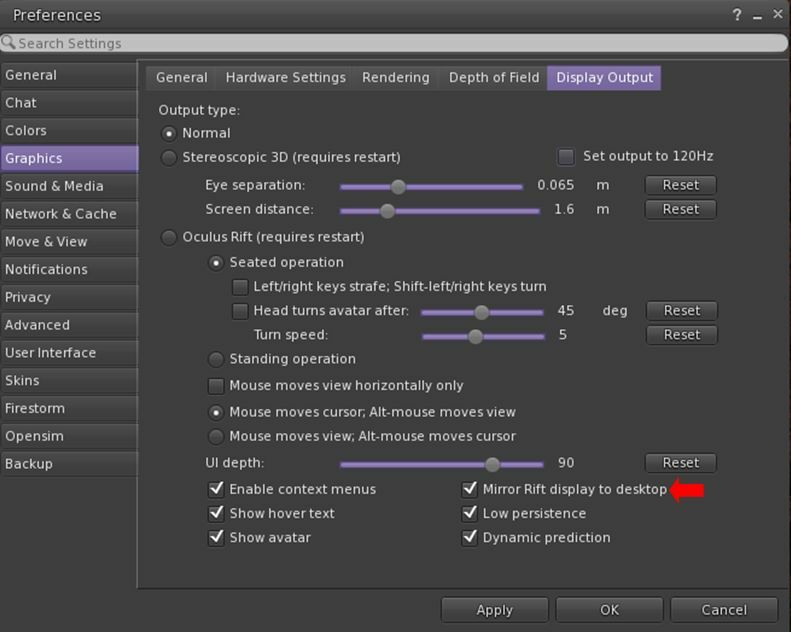 This alpha release of the CtrlAltStudio Viewer adds basic UI to the Rift DK2 display. This includes dialogs, avatar toasts, and floating text (i.e., the same UI as displayed with the DK1 in the 1.2.1 Release). Added fade-to-black around the barrel distorted image edges. Stopped showing the health & safety warning the second and subsequent times into Riftlook view. Fixed barrel distorted images being displayed lower on the screen than they should be. Usage is the same as the previous alpha releases. With the DK2 configured in extended mode: use the Windows key + RIGHT CURSOR to move your viewer window onto the Rift’s display, then CTRL+ALT+3 to make the window full screen and switch into Rift view. As with the previous ALpha releases with DK2 support, this version will install into its own directory, allowing it to be used alongside the release version (although it will obviously over-write Alpha 1 or ALpha 2, if installed). Further information on the release can be found in the release notes.